Week 12: Top table challenges intensify in both divisions. While not every team has played half their season, Saturday did marked the half way point of the Legal League Division 1 season with DBFC maintaining their 5 point advantage after a “smash and grab” win against Club Tropicana at Po Kong Village. Tropics came out the traps the fastest and had the ball in the net after 1 minute only for Nicky Lam’s header to be judged off-side in a very tight call. DB then had a series of corners in a row but from a breakaway Tropics won a penalty when veteran Dave Morson brutally wrestled the aforementioned Nicky Lam to the ground. A red wouldn’t have been out the question give the goal scoring opportunity but the ref, who for most part was excellent, allowed Morson to escape without even a yellow. Kyle Wagner stepped up for Tropics but saw his effort saved down low to the right. 10 minutes later Tropics once again had the ball in the net from a sublime Wagner finish but again the lino raised his flag. Second half saw DB have more possession and territory but were caught out a few times on the break before they pounced with 10 minutes to go getting in behind the Tropics defense and a cross field ball saw Matt Hoare tap in to take DB back to 5 points ahead of USRC who had closed the gap to 2 the previous evening. USRC manager Stephen “Spear” Cairns described his teams 1-0 victory of J-Leaguers as a “very tight but deserved” win as a Thomson Young strike was the difference. The win moved 2nd placed USRC 4 points ahead of J-Leaguers who sit 3rd on goal difference ahead of Goodfellas and Corinthians. Fella’s sit joint 3rd as they beat a depleted Corinthians 3-0 in a late kickoff. In an even first half an Isaak Pyrillis goal separated the team at the break. The second half however saw Fella’s stretch away for a deserved win picking off Cors twice more as Isaak netted his 2nd before Steve Franklin added a third. Millwall v West Ham…..Boca v River Plate…..Celtic v The Rangers…….Spartans v Spartans!!! The Spartans franchise has more teams than there are sticky patches on the Amazonia dance floor and it was Saturday that the Wanchai and Soho versions squared off. Intelligence reports from Hong Kong finest meant that for safety reason the match was moved to an out of town venue so Tsing Yi was the venue for what proved to be a mauling for Soho’s as they went down 7-1. The game was balanced at 1-1 at half time when new signing Jose “Dani” Aguilar headed Wanchai in front before Cowls equalized for Soho. The second half however was a different story as Wanchai run riot scoring a further 6 and having a further 3 chopped off for offside. Second half goals came via Jose Aguilar (2), Simon Lui, Myca Cedeno, Phil Bracker and Erez Asaraf. Wanchai Spartans were not the only team to bag 7 however as a whopping ELEVEN goals were shared between HK Scottish Stags and Forward FC with the Stags running out 7-4 winners. With the game finally balanced after 60 minutes two quick goals turned the game a late strike sealed the 3 points for Scottish. Scottish Goals: Myles Winter (3), James O'Shea, Robert Chapman, James Hill, Thomas Bartles Forward Goals: Jose Lorenzo, Jesus Collado, Tomas Lucena and Vu Pham. It was another goal feast as Bants and Krauts shared 6 goals to each earn a point. Five of the goals came in the first half of a scrappy encounter with Fritz von Storch (2) and Patrick Bez netting for Krauts with Sam Ameen and Alexis Devaud replying for Bants. A much quieter second half saw Brandon Kings shin being the only goal to make the match finish 3-3 and an overall fair result. The crucial festive period is upon us in Legal League terms and as the weather cools (apparently), the temperature at the top of the Division 2 table intensifies with the top 5 all cranking up the heat on one another. First in to the fire were Dragon Valley who faced off against a red hot Revolution FC. With both sides missing a few regulars it was a day to dig deep and battle through. Revo started strong and soared in to a 3-0 lead thanks to a first half hat-trick from Tim ‘enormous man’ Rechter who has now had almost as many nicknames as goals this season. Described as a “one-legged wonder” by Revo manager Snelly, this was a clear demonstration that mobility is over-rated. Playing with a dodgy hamstring, Rechter still managed to head home twice and poke another one in raising the question if maybe he should be injured more often. DV pushed on in the 2nd half but were unable to find a way through a rev-olute defence and a giant goalkeeping display before 3 became 4 when a dodgy backpass was handled by Dragons keeper - Andrew McLeod stepping up to smash home after the ball was rolled to him a la Shearer vs Georgia ‘97. It could have been worse for DV who were fortunate to escape a red card near the end with the quote of the day going to the defeated manager, “By then the referee had considered the Dragons corpse had been mutilated enough”. San Pells have now racked up a highly impressive 10 wins from their opening 11 games, staying top thanks to a 3-1 success over Vikings. Gary Pratt and James Redmayne were both on target although the headlines were saved for Tom Ryan who delighted the bumper crowd at Wu Shan with a goal of the season contender. Despite the victory, San Pells felt they were not at their best and spurned a number of good opportunities particularly in the first half – bad news for the rest of the league if there is still more to come. Mes kept the league leaders honest remaining just 1 point behind after they thrashed Legal Head 9-1. The Head boys have had a couple of tough results of late and can be forgiven for looking forward to the Christmas break and the subsequent league split. 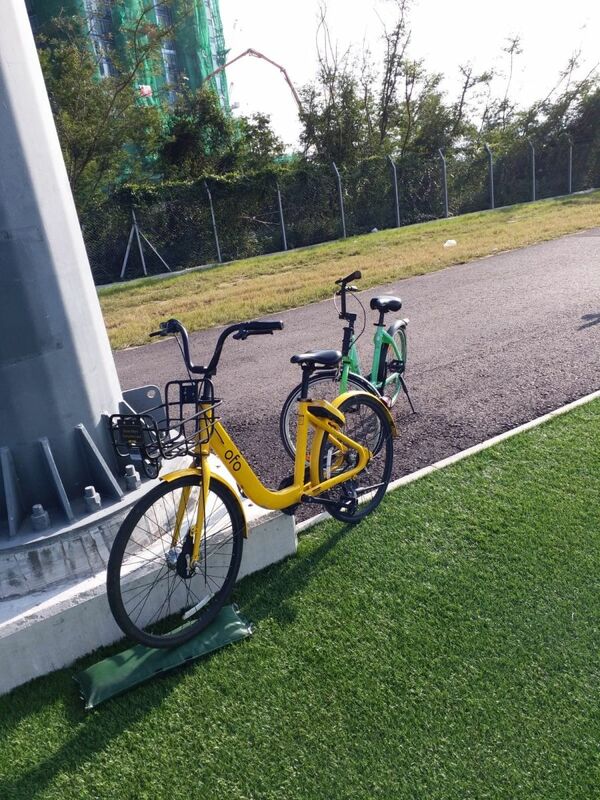 Their cause was not helped by some of HK’s finest taxi services dropping a couple of players off in the middle of nowhere then subsequently returning them to the MTR, leaving them to ‘improvise’ to find their own way to the pitch. Seems the Legal Head backline also went missing as Will Harvey (2), Chris Delaglesia (2), Liam Kelly, Lar Finnerty, Rob Barratt, Laurence Garner and Dara Fahy racked up the goals for Mes. Darragh Keenan replied in vain. The bottom of the table saw MBFC line up against Young Guns in what turned out to be an unexpected 5 goal thriller. YG started the game with 9 men allowing MBFC to smell blood and subsequently establish a 1-0 lead at the break thanks to a Pang Chao strike. A full quota of Young Guns emerged for the second half and they were soon level through Justin Wong. In a ding-dong encounter, MBFC then broke away twice with further goals from Wang Miao and a second for Pang Chao. Albert Tong pulled one back for YG but it was too little too late as MB held on for their first win of the season, moving them off the foot of the table and into the dizzying heights of 14 place now level on points with their opponents. Back up the league, Wanchai Wolves continued their challenge at the top with a 4-0 win over Shooters. A succinct match report saw Victor Johanssen score again, Ronnie Ho get 2 and Alistair Kanaan add a 4th for a Wolves side now looking almost assured of a top half place. 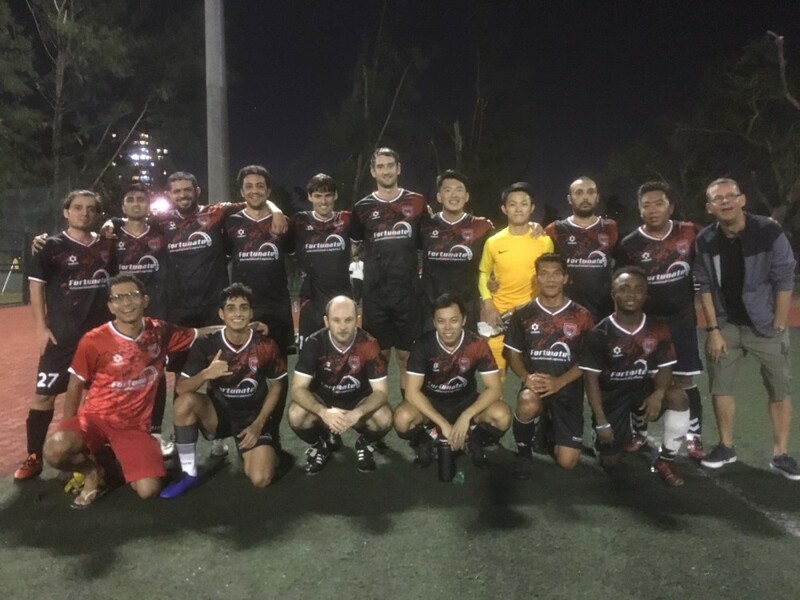 Samurai Blue are another side on a roll as they dispatched BOCs 6-1 in a delightful 8pm kick off at Kowloon Tsai (Kais querying the time despite being fixtures officer…..). 2-0 up at Half Time, SB then conceded a penalty giving their opponents a sniff of a comeback. As is so often the case when your luck is out though the penalty was missed and from there the victors found an extra gear to pull away. Christopher Matthew Corcoran, Kevin Frimpong (2), Ahmed Jemli (2) and Wassim Laribi all finding the back of the net. Evergreen Jase Lee racking up yet another LL goal for BOC who slip to the bottom of the table. Just one game took place on Monday with KCC Royals facing off against Old Speckled Men at Kings Park. In a proper match under the floodlights, KCC edged ahead through Dan Jacques in the 2nd half but were unable to hold on as the Speckles came battling back to nick it thanks to S Harrington and J White. 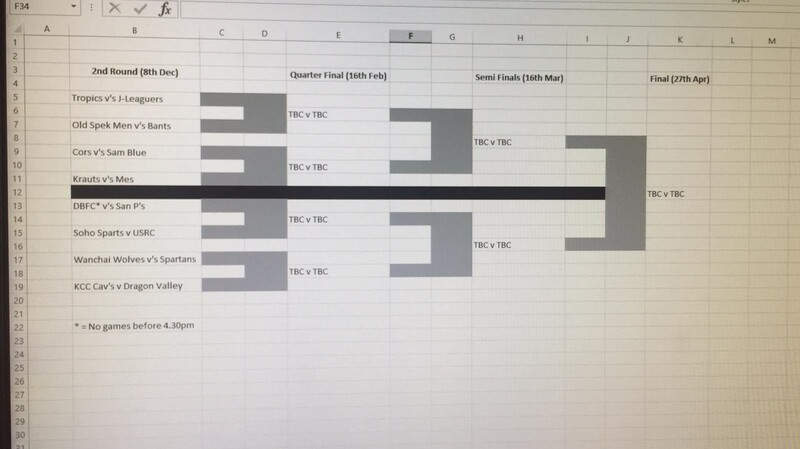 That result meaning there is now just 1 point between the two sides as the business end of the season approaches.....Cup format below.